Mitosis is a miraculous process. In the making of the three trillion cells of our bodies it manages to faithfully replicate and share the chromosomes equally between all the daughter cells. This lesson focuses on the key details of mitosis and activities using an interactive animation and some questions help students to make sense of these details in the context of the whole process of mitosis. How do cells divide their nucleus in two? What do you think is happening to the chromosomes in the two cells in the diagram? What happens to double the amount of DNA inside the nucleus during interphase? Study this Interactive animation of Mitosis from Cells Alive and read the details on the page beneath to see what happens in mitosis. Keep a mental note of what happens to the chromosomes in each of the main stages. Prophase, Metaphase, Anaphase, and Telophase. 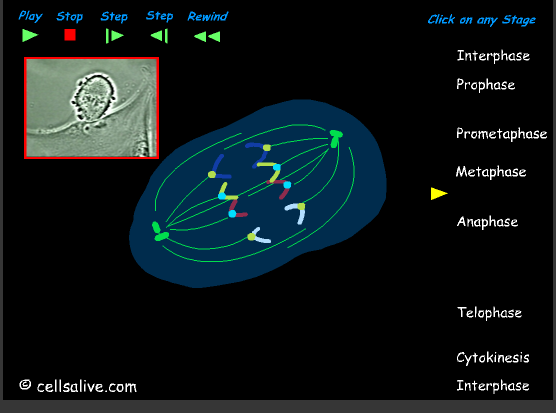 Mitosis flash animation - from Prenhall.com This is one of the clearest animations I have seen. Using the animation in Activity 1 complete the Student activities on mitosis shown below. Try this data analysis activity about mitosis. This link to mitosis is not immediately obvious, this is the sort of question which tests a students ability to work out what is happening in a specific biological study which they haven't seen before. Why do some 'villi' grow longer than others? The evidence in the study supports the concept of deregulated mitosis in the small intestines, which may cause cancer. A good way to run this lesson is either to demonstrate the animation on the white board, or give the students access to the page, and let them explore the animation in Activity 1 at their own pace. There is a short set of IB style questions to give students a chance to express their knowledge and understanding of mitosis in a more formal way.